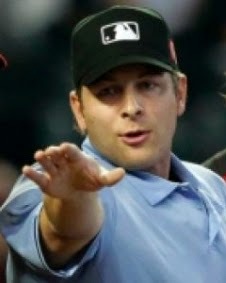 Umpire Ben May made his MLB debut during the Blue Jays-Twins doubleheader in Minnesota on April 17. May joined chief Tom Hallion's crew, serving as Thursday afternoon's third base umpire during Game 1 alongside 2B Umpire Hallion, 1B Umpire Eric Cooper and home plate umpire Chris Guccione. May rotated to the second base position with Pat Hoberg behind home plate for Game 2. May is on the International League umpire roster for the 2014 season, which is his 3rd season in the IL and AAA. May began his career in Minor League Baseball in 2007's Gulf Coast League and worked the New York-Penn, Midwest, Florida State, Eastern and Puerto Rican Winter Leagues before his promotion to Triple-A. He worked the 2011 All-Star Futures Game in Phoenix, 2012 Arizona Fall League (and 2012 AFL Rising Stars Game) and 2013 World Baseball Classic Qualifying in Germany. May was born and resides in Racine, Wisconsin and wears the sleeve uniform number 97, last worn by Todd Tichenor, at the Major League level. The 6-foot , 200-pound May, who makes his MLB debut at the age of 32, is an alum of St. Catherine's in Racine. Good stuff. Curious if there is an 'official source' for this data? Where did you pull from? All information here was compiled from all posts we have written since Opening Day (we input the data ourselves). Sat next to this man at umpire school. While we both got jobs in MiLB... I know moving him up the ladder over me is the RIGHT call! CONGRATS. to my dear friend... BEN MAY!! !